When Michael Jordan announced his return to the NBA with the Washington Wizards in 2001, the basketball world scrambled to predict just how good the world’s greatest player would be in his monumental return to the hardwood. Fortunately for the Wizards, Jordan’s three season break was not enough to dull his varied skillset, with future Hall of Famer scoring 19, 31, and 20 points in his first three games back. Jordan averaged 22.9 points per game in the 2001-02 season, a year that included the 13th All-Star selection of Jordan’s storied career. The versatile wingman added 5.7 rebounds and 5.2 assists per game while leading the Wizards with 1.4 steals per contest. Jordan played a final season with the Wizards in 2002-03, averaging 20 points per game for the 15th consecutive season. Playing at the age of 39, Jordan made the All-Star Game yet again to put an appropriate cap on the greatest career in NBA history. In 2009, Jordan was inducted to the Naismith Memorial Basketball Hall of Fame on his first ballot. 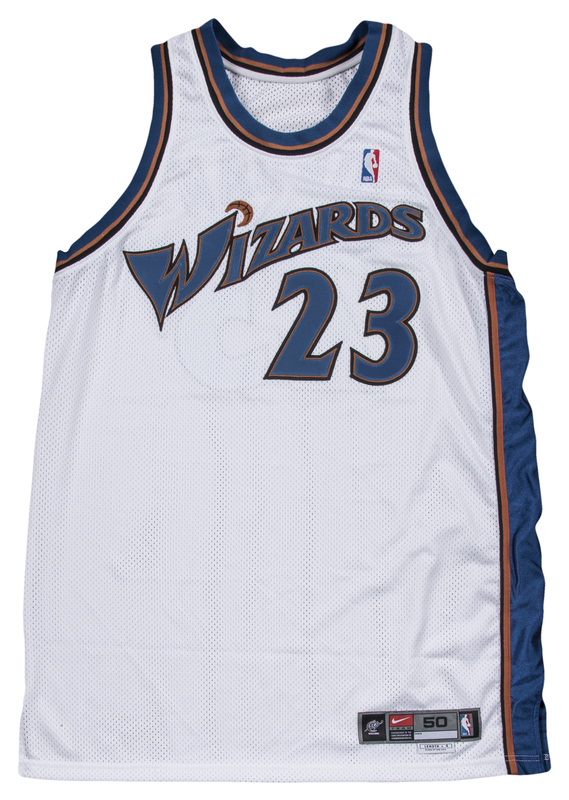 This offered white Jordan Wizards jersey has “Wizards” and Jordan’s iconic number “23” sewn on the chest in teal, brown, and black tackle twill. 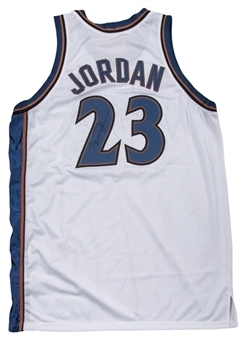 “JORDAN” is sewn across the back shoulders in teal and brown tackle twill above a second “23”, this time sewn on the jersey in teal, brown, and black tackle twill. 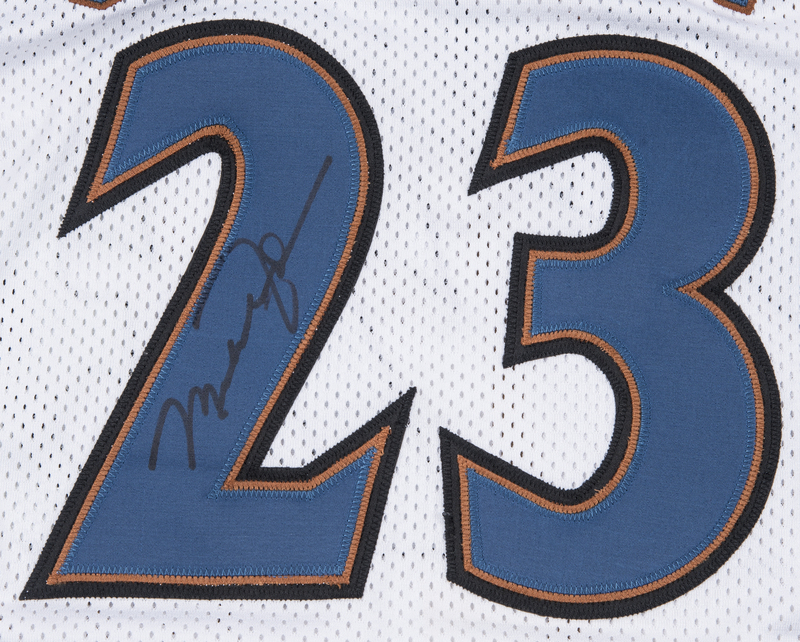 The left side of the jersey features a teal panel bordered with a black and brown band. A NBA logo patch is sewn on the left chest and a Nike size “50” tag is sewn on the front left tail. 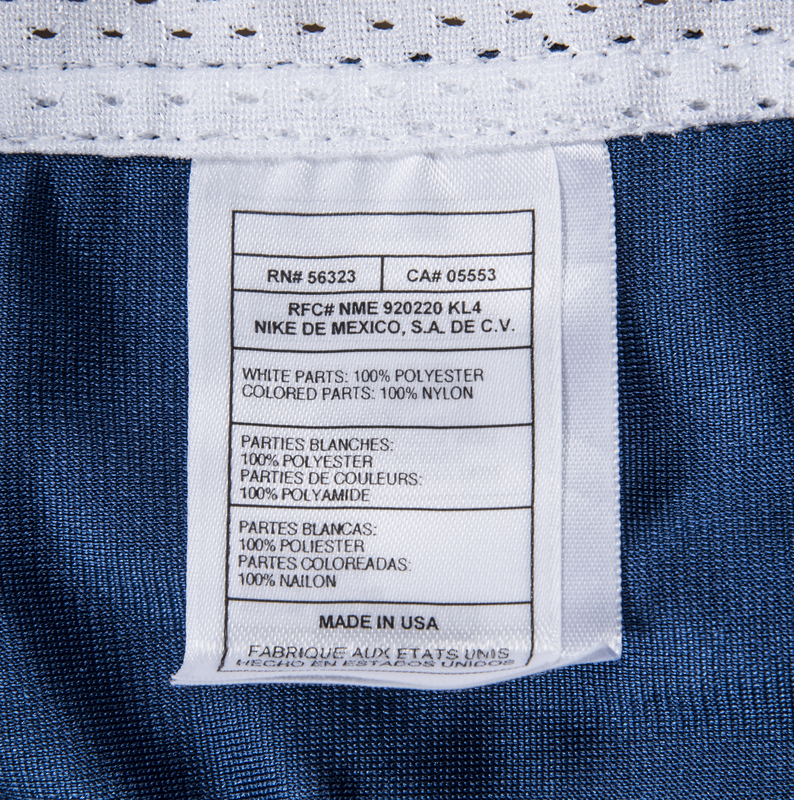 A “Length +4” flag is attached to the Nike size tag. 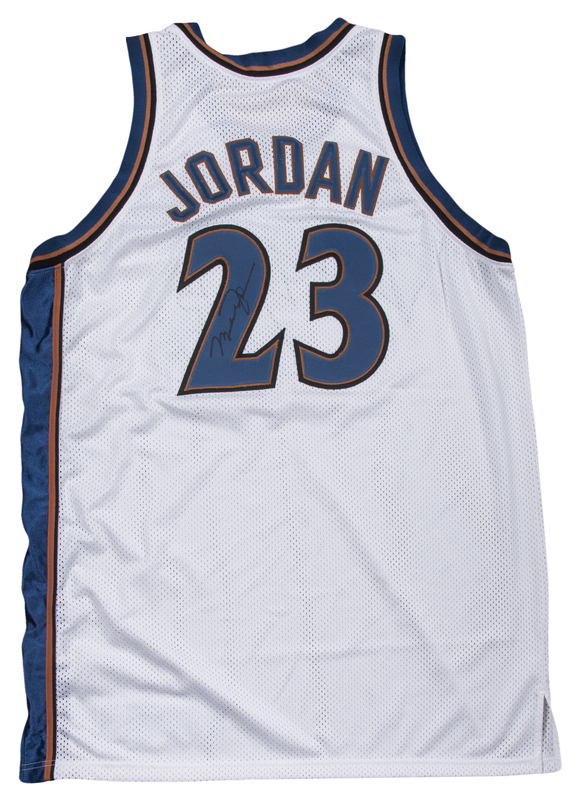 Jordan has signed the “2” digit on the back of the jersey in black marker. This jersey originates from the personal memorabilia collection of Tyronn Lue. 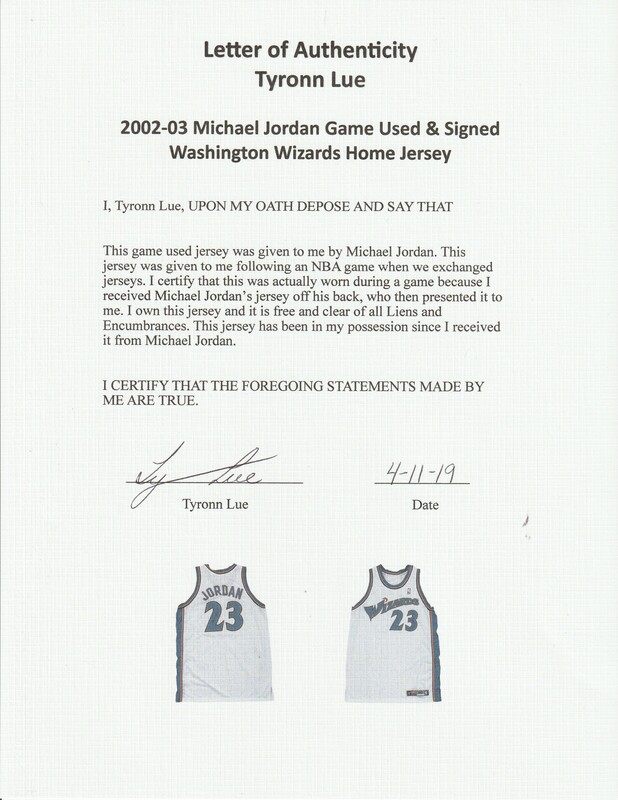 Jordan’s signature comes with a LOA from JSA and a LOA from Tyronn Lue accompanies this lot as well.